The United States fired cruise missiles on Friday at a Syrian airbase from which President Donald Trump said a deadly chemical weapons attack had been launched, the first direct U.S. assault on the government of Bashar al-Assad in six years of civil war. U.S. President Donald Trump says he ordered a targeted military strike on the airfield in Syria from which a deadly chemical attack was launched and added there could be no dispute that Syria had used banned chemical weapons. The United Nations Security Council will meet at 1130 EDT (1530 GMT) on Friday to discuss Thursday's U.S. cruise missile strikes on Syria, diplomats said. ReutersU.S. strikes on Syria in retaliation for a chemical weapons attack marked a sharp escalation in the country's civil war but were not viewed in the Arab world as a gamechanger in a six-year conflict that has divided the region. ReutersThe European Union said on Friday it understood the aim of U.S. missile strikes in Syria as an effort to deter any more chemical attacks there, but highlighted political solutions as the only way to end the war. ReutersThe Syrian opposition applauded a U.S. cruise missile attack on an airbase near Homs on Friday but said it must not be a one-off and was not enough on its own to stop government warplanes from hitting rebel-held areas. "Any military operation by a state on the territory of another without the consent of the other amounts to an international armed conflict," ICRC spokeswoman Iolanda Jaquemet told Reuters in Geneva. "So according to available information - the U.S. attack on Syrian military infrastructure - the situation amounts to an international armed conflict." ICRC officials were raising the attack with U.S. authorities as part of its ongoing confidential dialogue with parties to the conflict, she added. Here's the full text of President Trump's statement to the American people last night after issuing U.S. military strikes in Syria. Read more. My fellow Americans: On Tuesday, Syrian dictator Bashar al-Assad launched a horrible chemical weapons attack on innocent civilians. Using a deadly nerve agent, Assad choked out the lives of helpless men, women and children. It was a slow and brutal death for so many. Even beautiful babies were cruelly murdered in this very barbaric attack. No child of God should ever suffer such horror. Years of previous attempts at changing Assad's behavior have all failed, and failed very dramatically. As a result, the refugee crisis continues to deepen and the region continues to destabilize, threatening the United States and its allies. Tonight, I call on all civilized nations to join us in seeking to end the slaughter and bloodshed in Syria, and also to end terrorism of all kinds and all types. We ask for God's wisdom as we face the challenge of our very troubled world. We pray for the lives of the wounded and for the souls of those who have passed. And we hope that as long as America stands for justice, then peace and harmony will, in the end, prevail. Hours after a poison gas attack in Syria killed dozens of civilians on Tuesday, President Donald Trump's intelligence advisers provided evidence Syrian leader Bashar al-Assad was behind the atrocity, officials said. 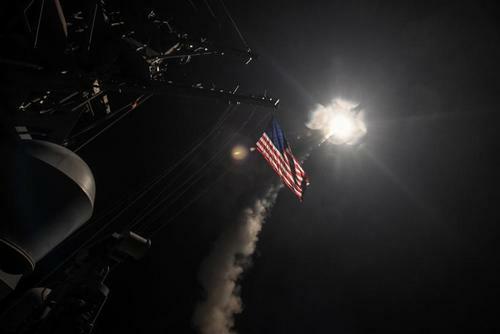 International Committee of the Red Cross raising U.S. air strikes on Syria airbase with U.S. authorities - spokeswoman. EXCLUSIVE: Red Cross says situation in Syria now 'amounts to an international armed conflict' after U.S. military operation. Russian Foreign Minister Sergei Lavrov has hit out at U.S. airstrikes on Syria calling them an 'act of aggression'. Syrian rebels welcomed a U.S. missile attack on a Syrian army airbase on Friday but said Washington's "responsibility" did not end there and military action should continue to prevent the Syrian government using airbases and banned weapons. A statement from the Free Syrian Army - an alliance of rebel groups - said it welcomed the raid against the base near Homs city, calling it the "correct starting point" for confronting terrorism and finding a "just political solution" to the war. "We view that the responsibility of the United States is still great, and does not stop with this operation," the statement said, warning that the government and its allies could commit "acts of revenge" against civilians. Russia has demanded an emergency meeting of the United Nations ceasefire task force in Geneva to discuss U.S. missile strikes on Syria, the RIA news agency quoted a diplomatic source as saying on Friday. Such meetings are chaired by U.N. Syria envoy Staffan de Mistura and were set up in early 2016 with joint U.S.-Russian backing. They are a forum for diplomats to talk about breaches of Syria's shaky ceasefire. Moscow wants the meeting to be held in Geneva today at 1500 GMT, the source told RIA, adding that the task force would discuss "the situation on the ground with connection to the U.S. missile strike on Syria's Shayrat airbase." The United States fired cruise missiles earlier on Friday at the base from which President Donald Trump said a deadly chemical weapons attack had been launched. 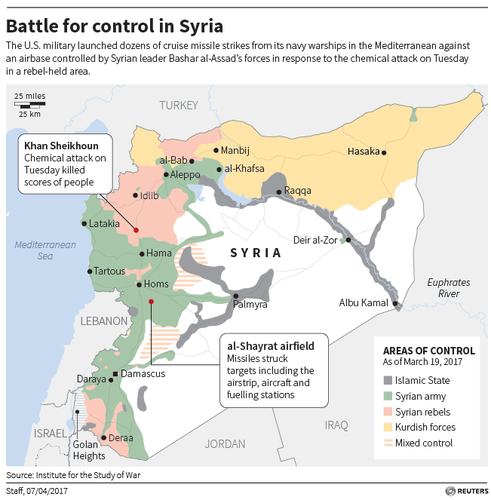 Russia has sharply condemned the strikes. Turkish President Tayyip Erdogan on Friday hailed an attack by the United States on a Syrian air base as a positive development but said it was not enough on its own and "serious steps" were needed to protect the Syrian people. The United States fired cruise missiles earlier on Friday at a Syrian base from which President Donald Trump said a deadly chemical weapons attack had been launched, marking the first direct U.S. assault on the government of Bashar al-Assad in six years of civil war. "We find it a positive and concrete step taken against the war crimes of the Assad regime. Is it enough? I don't find it enough. It is time to take serious steps for the protection of innocent Syrian people," Erdogan told a rally in the southern province of Hatay. "The international community has the capability to stop the regime and terrorist organizations. I hope the active stance that the United States displayed in Idlib is a beginning with regards to such developments," Erdogan said. The European Union on Friday said U.S. missile strikes on a Syrian airbase had the "understandable intention" of preventing more chemical attacks but stressed that a negotiate solution was the only way out of the conflict. "The US has informed the European Union that ... they launched a strike on Shayrat Airfield in Syria with the understandable intention to prevent and deter the spread and use of deadly chemical weapons," the EU's top diplomat Federica Mogherini said on behalf of the bloc's 28 member states. "The US also informed us that these strikes are limited and focused on preventing and deterring further use of chemical weapons atrocities ... Those found responsible should be sanctioned within the framework of the United Nations." JUST IN: U.S. defense stocks up pre-market after U.S. missile strike in Syria: Lockheed Martin up 1.5 percent, Boeing up 1 percent, General Dynamics up 1.2 percent. ReutersThe United States fired cruise missiles on Friday at a Syrian airbase from which President Donald Trump said a deadly chemical weapons attack had been launched, the first direct U.S. assault on the government of Bashar al-Assad in six years of civil war. The United States fired cruise missiles on Friday at a Syrian airbase from which it said a deadly chemical weapons attack had been launched this week, the first direct U.S. assault on the government of Bashar al-Assad in six years of civil war..
ReutersThe safe-haven yen climbed against the dollar and euro on Friday and the ruble tumbled, after the United States launched cruise missiles at an airbase in Syria, raising tensions with Russia. Russia's airbase in Latakia province and its naval facility in Tartus are protected by S-300 and S-400 air missile defence systems, a Russian lawmaker was quoted as saying by RIA news agency on Friday. "The S-300 and S-400 missile complexes....adequately guarantee the security of our armed forces on land as well as by sea and air," Viktor Ozerov, the head of the defence and security committee of Russia's upper house of parliament, said.